Most of the areas within modern Greece's current borders were under the occupation of the Ottoman Empire from the mid-15th century until the Greek War of Independence in 1821 and the establishment of the modern Greek state in 1832. The islands, however, like the rest of Greece, are legally and historically Greek, as their names indicate. Turkey's ruling Justice and Development Party (AKP), however, and even much of the opposition seem intent on, if not obsessed with, invading and conquering these Greek islands, on the grounds that they are actually Turkish territory. In December, for instance, Kemal Kılıçdaroğlu, the leader of the main Turkish opposition CHP party, stated that when he wins the election in 2019, he will "invade and take over 18 Greek islands in the Aegean Sea, just as former Turkish PM Bulent Ecevit invaded Cyprus in 1974." He said that there is "no document" proving that those islands belong to Greece. Meral Akşener, the head of the newly established opposition "Good Party," has also called for an invasion and conquest of the islands. "What is required must be done," she tweeted on January 13. "Their courage persists only until they see our army, our ships and our planes... Whatever Afrin is to us, our rights in the Aegean and Cyprus are the same. Do not ever think that the natural gas exploration in the waters of Cyprus and the opportunistic attempts in the Aegean Sea drop off our radar. Our warships and air forces are keeping an eye on the area closely to intervene in every way when required." "Those who think that we have erased from our hearts the lands from which we withdrew in tears a hundred years ago are wrong. "We say at every opportunity we have that Syria, Iraq and other places in the geography [map] in our hearts are no different from our own homeland. We are struggling so that a foreign flag will not be waved anywhere where adhan [Islamic call to prayer in mosques] is recited. "The things we have done so far [pale in comparison to the] even greater attempts and attacks [we are planning for] the coming days, inshallah [Allah willing]." Neo-Ottomanists in Turkey still proudly embrace the concept of jihad (Islamic holy war) against the kafirs (infidels). 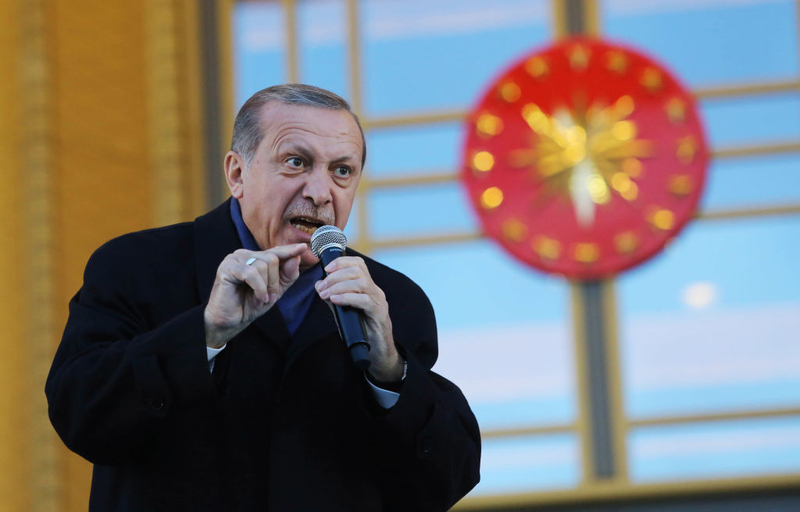 The head of the state-funded Directorate of Religious Affairs, the Diyanet, has openly described Turkey's recent military invasion of Afrin as "jihad."